Beyond Formalhaut recently wrote about wilderness exploration, and it got me thinking about a pair of posts I've been wanting to write for awhile now, comparing the two major ways I know of to explore adventuring sites within the wilderness: pointcrawls and mini-hex-crawls. By "adventuring sites" I mean spaces that call for a new scale for mapping. They're larger than dungeons, too large for 10' squares, but smaller than the overland wilderness, too small for 6 mile hexes. The ruined city is perhaps the archetypal "adventuring site" that seems to demand a new scale for mapping, but it could be any (probably outdoor) location that the characters can explore directly, rather than having the encounter hand-waved or abstracted - the exterior surrounding a dungeon, a cemetery or graveyard, a garden, a battleground, perhaps even the characters' own campsite. Adventuring sites call for a new kind of mapping to put them on paper, and a new kind of procedure to bring them into play. Pointcrawls and minicrawls are two different ways of mapping these new spaces, two different procedures for tracking and running the characters' movement through the space. That said, a judge should be able to run either map either way. The choice can be primarily one of personal preference, rather than one of necessity dictated by style of play. 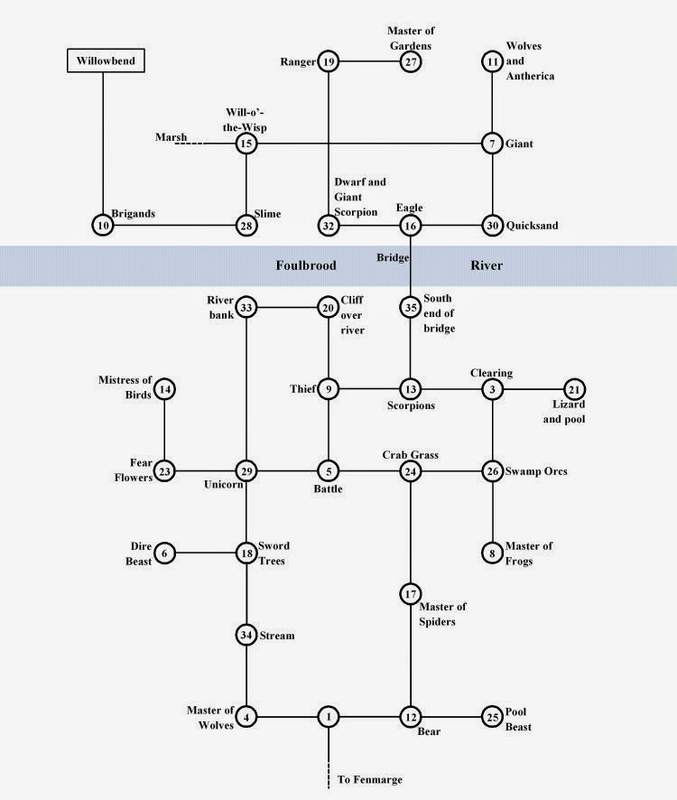 I suspect that for many judges, the choice will be made based on aesthetics, a preference for maps that look like flowcharts versus maps that look like maps. 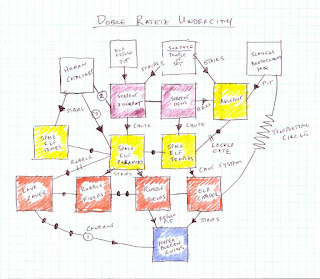 It might also be made on the basis of artistic talent (the ability to draw a map-like map that is "good enough" to be useful); on the basis of familiarity with and professional expertise at navigating flowcharts, org-charts, computer network diagrams, circuit diagrams and the like; or simply on the basis of owning pre-drawn maps in one style or the other. I think judges should choose for themselves, using whatever criteria they deem appropriate, and run the style they feel most comfortable with. So the purpose of these two posts is to look at the two methods, in order to understand them well enough to make an informed decision, not to prescribe one technique or the other. I think I prefer minicrawls, but writing this entry has given me a new appreciation for the uses of pointcrawling - especially as my search for examples has led me to see just how much proc-gen can be included in a pointcrawl. Hill Cantons gives a great overview of pointcrawling in general, talks about the utility of pointcrawling in undercities and in ruined cities. He also discusses the pros and cons of pointcrawling versus hexcrawling in a way that applies as well at the overland scale as it does at the sub-region scale. This is information only the judge sees, and it's shown in a way that's intended to maximize the most important information (what are the locations, and how do the characters get to them?) while minimizing extraneous detail. As much as I love map-like maps, they are full of extraneous detail - or if not, then they likely display the most important information inefficiently. 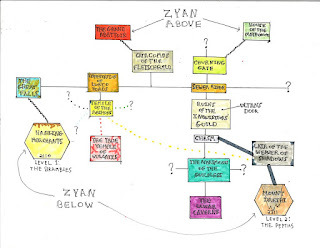 Consider just how much of those diagrams is empty space. On a pointcrawl diagram, that empty space is clearly segregated from the relevant details. On a traditional hexmap, relevant details are more or less indistinguishable from the empty space around them. One opportunity created by pointcrawling is to radically restrict the possible paths between two locations. Hexes by their very nature always have 6 exits, meaning that two locations any distance apart have a myriad of ways to travel between them. 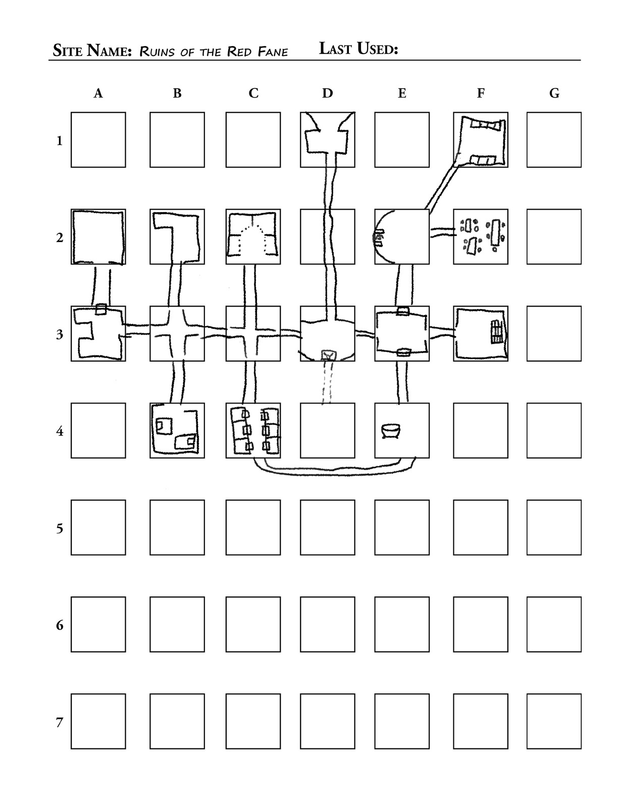 Pointcrawl locations can have any number of exits, meaning that different locations can have different numbers, and some exits (and thus some paths) can be secret, as in Figure 4 from Mazirian's Garden, which depicts both obvious routes and secret passages between locations. 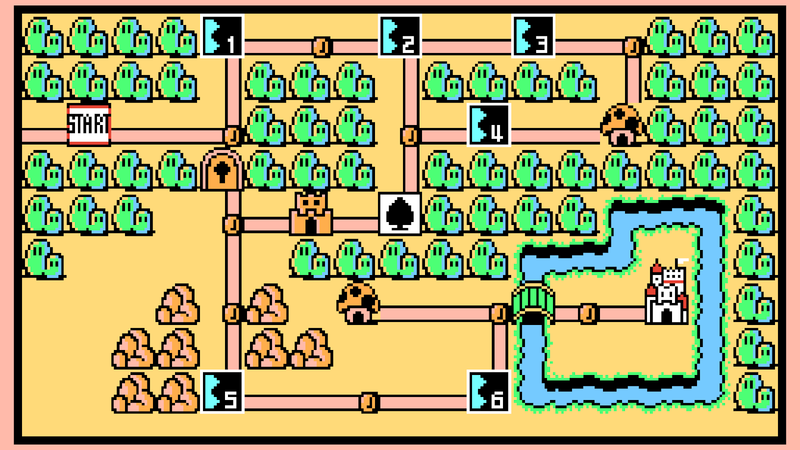 This is similar to Super Mario World's use of secret exists leading to secret paths to secret locations, as seen in Figure 5. Another thing that becomes possible on a pointcrawl diagram that's difficult or impossible on a hexmap (mini or otherwise) is to have two separate paths between each pair of locations corresponding to a kind of "easy-and-long versus hard-and-short" dichotomy. Each step of the way, the players can make a conscious choice to expend more resources to move safely, or to take on more risk to move quickly. There are probably ways to achieve this on a hexmap, but they're not as easy. Pointcrawling is also fairly flexible as to scale. 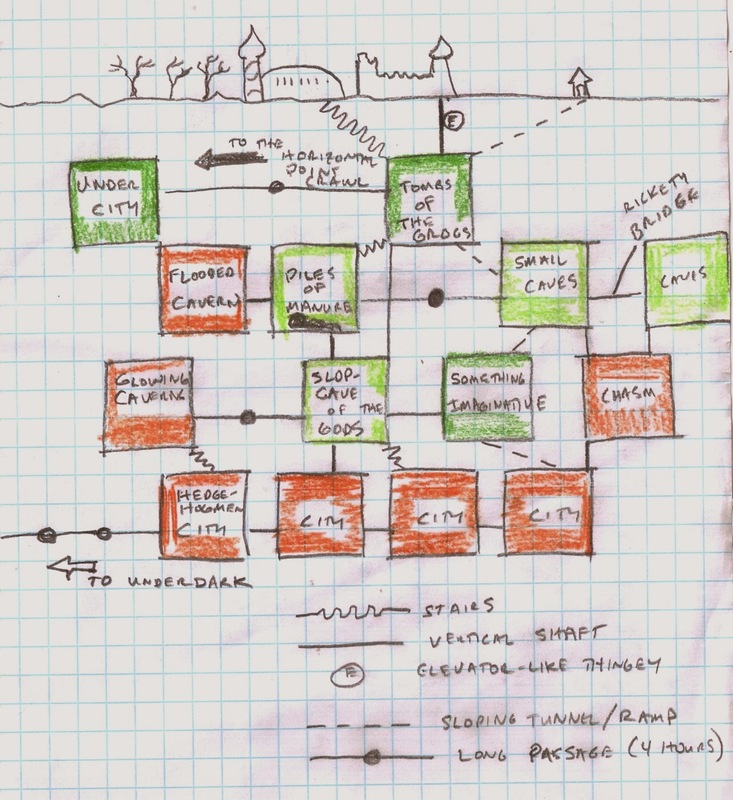 In addition to functioning at the scale of adventuring sites, an entire overland map can be set up as a pointcrawl, as can the interior of a dungeon. 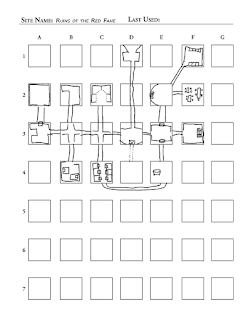 Figure 6 below is a sample dungeon from Red Tide that's drawn up as a pointcrawl rather than as a properly scaled gridmap. This flexibility of scale is something that hexcrawls can't really match. They work fine at the overland scale, and I think they work at the minicrawl scale of adventuring sites, but the abstract interior of hexes doesn't really suit the specific interior geography of dungeons, where gridmapping takes over. 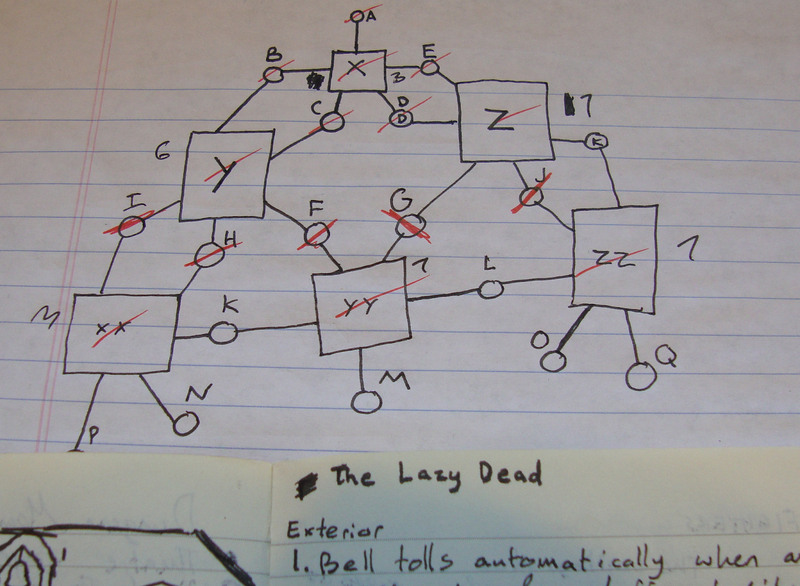 Papers & Pencils offers a different method of moving between pointcrawl locations, one that rather radically alters both the map and the procedure. In a typical pointcrawl the nodes are "places" and the "paths" are more abstract connections between the places. 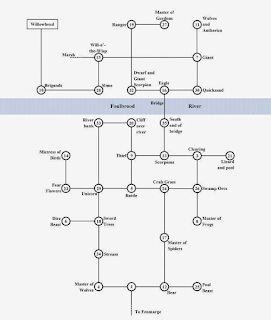 Each path connects two (and only) nodes, and time spent on the path is fleeting (in real time, if not in game time.) What Papers & Pencils offers is an innovation he calls "flux space," which changes how characters move between locations. The first effect is on the map. 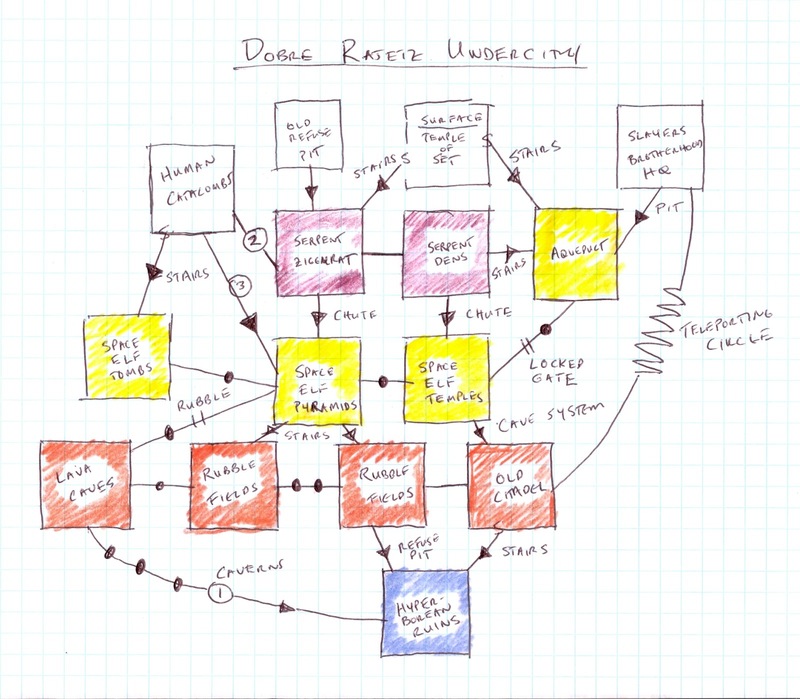 Including flux space inverts the usual relationship between the nodes and paths of a pointcrawl. Flux spaces become the primary nodes, while locations of interest are reduced to points along the paths connecting flux spaces. Characters who exit a flux space can potentially travel to several other locations, while characters who exit a location can only travel to flux space. In Figure 7 above, flux spaces are the large squares, while the regular locations are represented by the small circles. The second effect is probably a larger alteration to the style of play. It seems to me that pointcrawls that include flux space must feel very similar to hexcrawls. In a traditional pointcrawl, paths are non-spaces; traveling down a path feels like walking down the hallway in a dungeon, if it feels like anything at all. Flux spaces are spaces, though. They're abstract, like the interior of a hex, but moving through flux space to get from one location to another must feel much like passing through a room to get to another room in a dungeon, without entering the hall at all. In addition to their hex-like abstract interior geographies, flux spaces are also filled procedurally. Most locations in pointcrawls are pre-planned. Flux space turns those locations into islands and surrounds them with a sea of proc-gen, just as the planned locations on a hexmap are surrounded by hexes where unplanned content is added procedurally. Of course, using flux space isn't the only way judges can include procedural content in their pointcrawls. I'll return to address the false equivalence I think I've set up between pointcrawls and planning and between hexcrawls and procedural generation. But first I want to address the other false equivalence I think I've set up, between pointcrawls and diagram-like maps and between hexcrawls and map-like maps. When I post about minicrawls in part 2, I'll show some images that put the lie to the idea that hexmaps necessarily look like maps as opposed to diagrams. But it's also a mistake to think that pointcrawls can't look like maps. 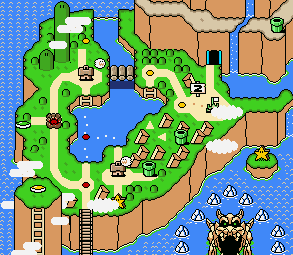 Consider the world of Super Mario Bros 3, shown in Figure 8 below (or the Donut Plains of Super Mario World, in Figure 5 above.) Arguably the map-ness or diagram-ness of any particular map is going to be as much about the talents and preferences of the artist as it is about whether it's for points or hexes. 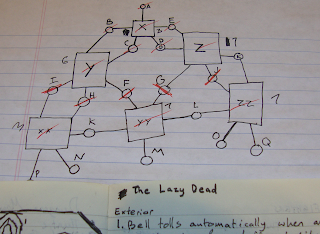 In practice, I think there is an affinity between pointcrawling and diagram-like maps, but I don't think that there's a necessary link between the two in principle. 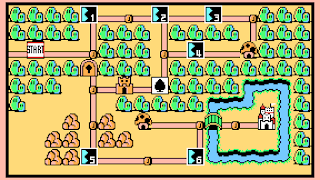 In fact, I think that pointcrawling techniques have a real utility for putting predrawn maps quickly and easily into play. 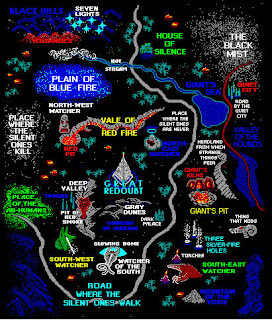 Think of all those predrawn maps of fantasy worlds, full of landmarks and not at all to scale. 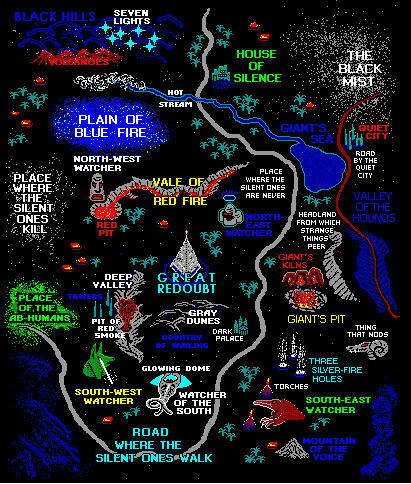 (Like the pixel-riffic map of the Nightland, shown in Figure 9 below.) 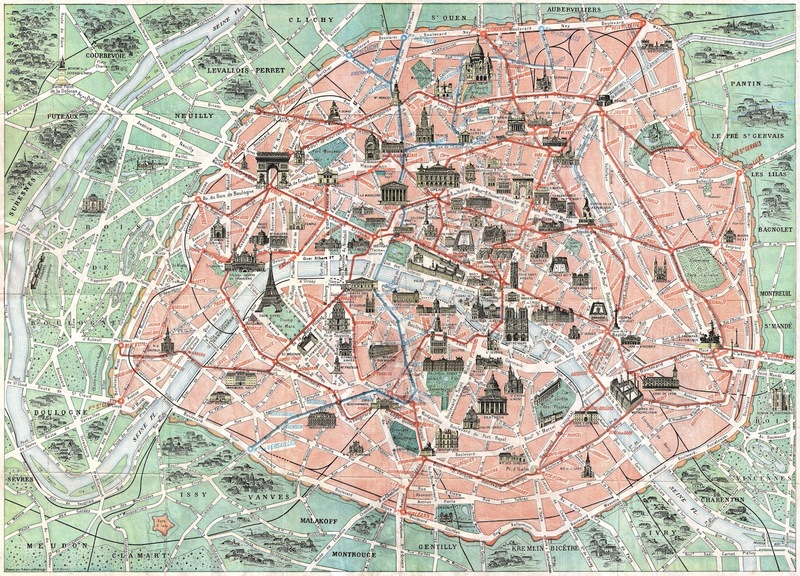 Or consider something like a classic (and public domain) landmark map of Paris, shown in Figure 10 below. It would be much easier to print off a copy in grayscale, number the monuments and parks and draw lines between them, than it would be to try to superimpose a hex-grid over it. I'll go further and say that I think pointcrawling is the correct procedure for running travel within a city. Each neighborhood acts as a "point," and has "paths" to the neighborhoods that adjoin it. This is not the say that cities have to be (or even should) be drawn looking like point diagrams, but rather - like objects in physics problems that can be approximated as point particles with the appropriate mass - that irregularly-shaped city neighborhoods can be treated as pointcrawl nodes for the purpose of character movement within and between them. Using pointcrawls to represent cities probably does a better job of matching how we think about urban travel in living cities than trying to overlay them with grids or hexes. I hit upon this idea while thinking about pointcrawls and cities, but I don't think I'm the first to think of it. 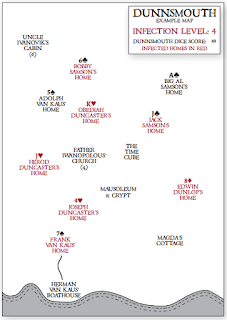 Both Last Gasp (in his city of Cörpathium, seen in Figure 11 below) and Unofficial Games (in his village of Dunnsmouth, seen in Figure 12 below) use pointcrawls to represent urban travel, with each node representing one neighborhood or one household, respectively. 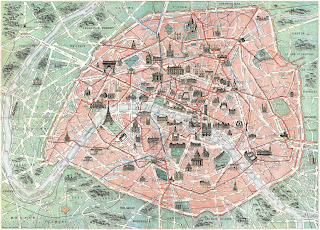 In Figures 11 and 12, Cörpathium and Dunnsmouth are depicted as traditional pointcrawl diagrams, but it's not difficult to imagine a traditional city-map of Cörpathium, looking like Paris in Figure 10 above, with the neighborhoods spreading outward from each node to meet at their borders, or Dunnsmouth with each household shown using a drawing of a house, with dirt footpaths connecting them. 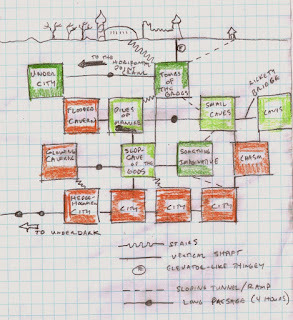 Torchbearer depicts its archetypal town (shown in Figure 13 below) using a logic that is also essentially that of a pointcrawl. Looking at Cörpathium and Dunnsmouth also returns us to my point about filling pointcrawls with planned or procedurally generated content - because both are exemplars of how a pointcrawl can be filled procedurally. Both Last Gasp and Unofficial Games use dice-drops to first generate random positions for their nodes. For Cörpathium, Last Gasp goes further and uses the dice-corners to determine the paths between nodes as well. He uses a list of 20 neighborhoods and landmarks; the value showing on each dice determines which location it represents (so lower numbered locations have a greater chance of appearing.) He has addition lists of possible neighborhoods that can surround landmarks. Also, the type of dice that showed a particular value sets some other random aspect of the neighborhood. 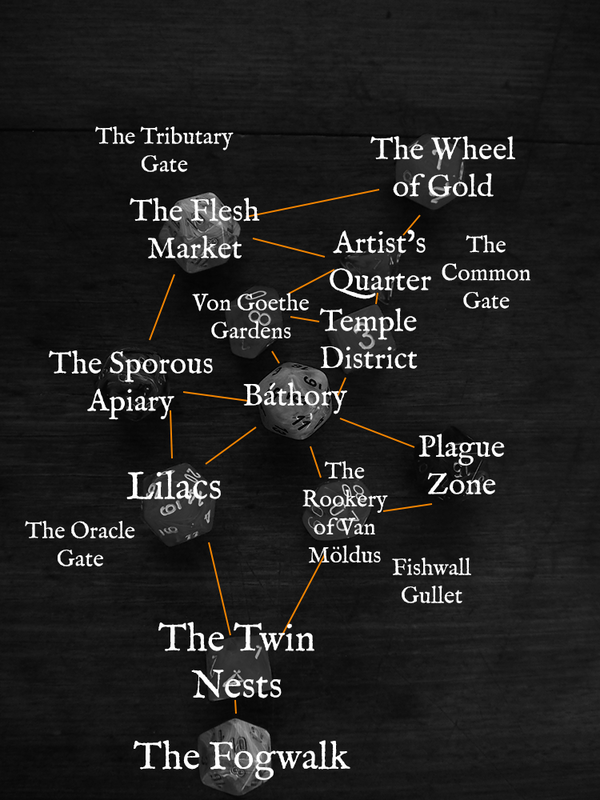 (So the number 1 location, the Artist's Quarter, has a different star artist with a different masterpiece depending on whether the 1 was rolled by a d4, d6, d8, etc.) There are other procedures as well, for locating the town gates, and determining characteristics of the city as a whole. 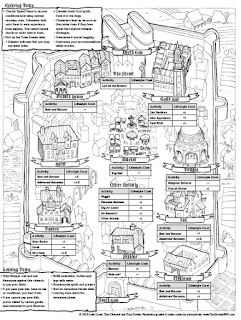 For Dunnsmouth, Unofficial Games rolls mostly d6s. 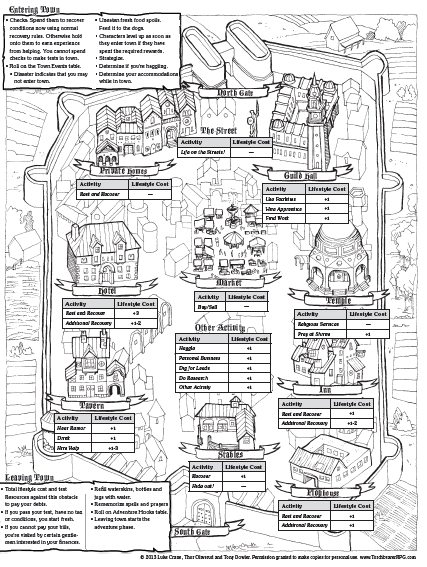 A d4 locates a magic item, a d8 locates a church, two d12s locate special buildings, and there are rules based on the dice locations for placing a pair of important NPCs and the town entrance. The value on the dice generally shows the household's relationship to the town mystery (except the d12s, where the value determines which building they represent.) 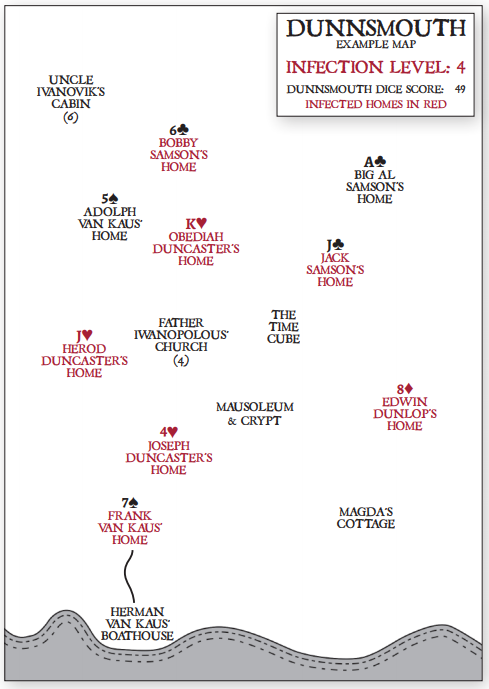 He also deals a single playing card for each household, with suits determining which of four main families the house belongs to, and the card value determining the residents. As we'll see when I write part 2 of this series, this kind of procedural generation is quite different from the proc-gen that typically goes into hexcrawls, although again, I think this is an affinity, not a necessity - there is no special reason why hexcrawls couldn't be populated this way, just as there's no special reason pointcrawls have to be filled using the random placement of pre-written content. It may be that the nodes of a pointcrawl invite us to imagine them as landmarks, while blank hexes invite us to imagine more general spaces. Or it may be that one or two exemplars have set a tone that the rest of us have continued to follow. Aside from the possibility that we've been overly influenced by the prior artistic decisions of a few trendsetters, I think that pointcrawls probably better model the way we think about traveling between known locations, while hexcrawls and minicrawls better model the way we think about exploring unknown spaces. I wake up in the Artist's Quarter, say, and plan to pass through the Temple District on my way to grab lunch in Bathory. Or I'm a tourist, visiting the Eiffel Tower, and thinking of crossing the river to go to the Arc de Triumph. I'm not particularly thinking in terms of north-south, or in terms of distances beyond far-near. I'm thinking in terms of landmarks and the known, usually direct, routes between them. This, I think, is the source of the affinity I've mentioned for using pointcrawls to accomplish certain tasks. As we've seen though, a judge who's interested in doing so can use them for pretty much everything, and as long as that's how they're comfortable running it, pointcrawls offer a flexibility that makes it relatively simple.